One of the biggest driving forces in legalizing marijuana in one country after another is medicinal pain relief and appetite stimulation that can only be provided by this herb. Permitting medical and recreational marijuana is a serious mission that demands serious cannabis strains that can meet the challenge. A new addition to our line-up is Royal Madre. This variety is primarily the results of crossing Jack the Ripper with Queen Madre and is a Royal Queen Seeds exclusive. Ultimately, it has a heritage of 75% sativa and 25% indica. To get an idea of what this strain has to offer, it helps to consider the effects of THC and CBD. THC is the component of reefer that supplies the classic high and the couch-lock trip. A good example of a pot strain loaded with THC would be Critical Mass. While both agents can stimulate a weak appetite, for the most part, it's the CBD that gives medical weed the ability to provide relief from such things as chemotherapy pain and nausea, anxiety, and many other afflictions. High THC strains of pot are the ones sought for recreational use. Although Scientific studies keep showing more benefits from this chemical. It can bring improvements in such ailments as Parkinson's disease, multiple sclerosis, and Crone's disease. 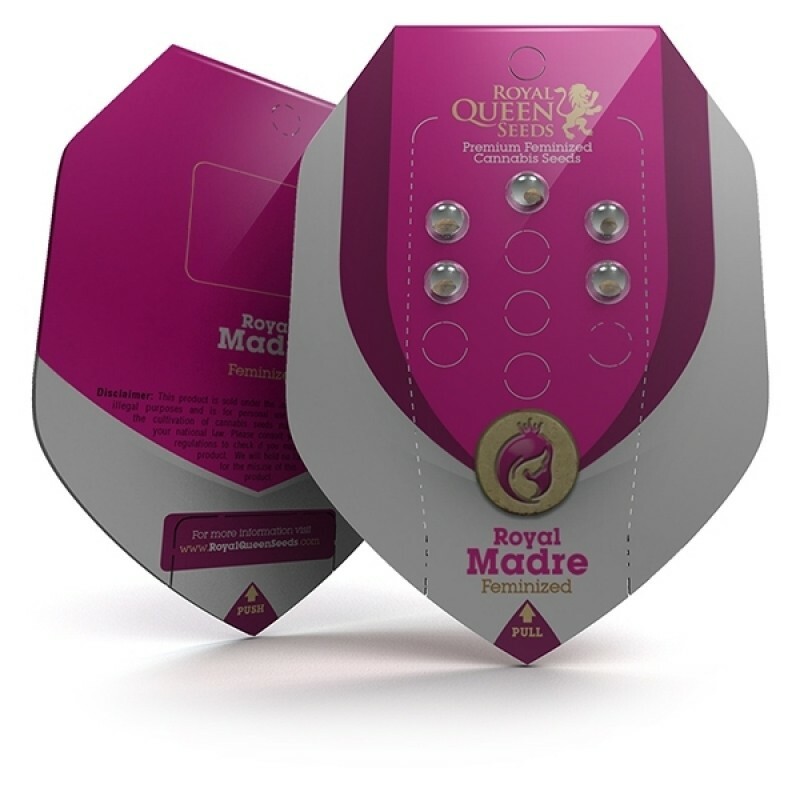 The feminized cannabis seeds of Royal Madre are easy to grow and generate plants that fall in the normal range for marijuana. With eight weeks until flowering, they're on the early end of the growing period. Indoors, they grow to an easy-to-handle range of 60 centimeters to one meter in height. With a typical climate-controlled setup, they'll produce between 400 and 450 grams of resin from one square meter of crops. If you prefer an outdoor setting and have the right conditions, you can expect plants of between one and just under one-and-a-half meters in height. This makes them relatively compact for the discrete grower. In this situation, they'll yield up to 500 grams from each plant and are ready for harvest in October. With a heritage that's mostly indica, it's no surprise Royal Madre has a strong Cannabinoid content and dense form. Both of its parents, Jack the Reaper and Queen Madre, have been described as fruity-tasting. Expect the same flavour here. With its strong qualities and taste it’s a must try for every cannabis lover. A Chitral kush from the Hindu Kush mountain range in Afghanistan and Pakistan.With an unique strong ..
Another cannabis version of the holy grail of the 1990's, which surprised the whole seed business. A..
Big Bomb Auto is the massive producing auto flowering version of our top yielding strain Big Bomb. C.. Surprisingly fragrant and frosty buds. Crystal-covered nugs with a good yielding structure for indoo..